Neonatal minimally invasive surgery (NMIS) requires a high level of training in both neonatal and MIS disciplines. 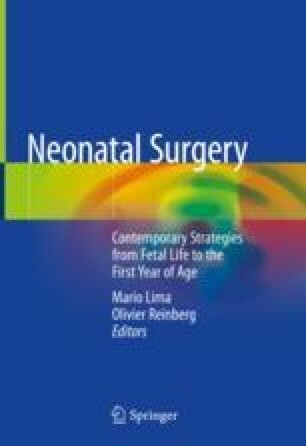 It requires a progressive goal-oriented curricula content specific to each surgical neonatal pathology. Evaluation of the theoretical and practical contents at each stage of training is mandatory. Surgical skills training has been classically done in the operating room under the supervision of the senior surgeon and in animal models, when available. The difficult learning curve combined with the few cases per year for each surgeon is a critical factor against the spread of these procedures that are feasible and effective in experts’ hands. Bailez MM, Maricic M, Aguilar JJ, Flores P, Losada P, Debbag R, Schiavo P. Low-cost simulation model for training MIS repair of duodenal atresia combined with telementoring technology: initial assessment. J Laparoendosc Adv Surg Tech B, Videosc. Published online Dec 2016. https://doi.org/10.1089/vor.2016.0381. Maricic MA, Bailez MM. Inanimate model to train for the thoracoscopic repair of all varieties of left congenital diaphragmatic hernia (CDH). Epublication WebSurg.com. 2018;18(7). http://websurg.com/doi/vd01en5252. Fahy AS, Fok K-H, Gavrilovic B, Farcas M, Carrillo B, Gerstle JT, Azzie G. Refinement in the analysis of motion within low-cost laparoscopic simulators of differing size: implications on assessing technical skills. J Pediatr Surg. 2018. https://doi.org/10.1016/j.jpedsurg.2018.08.014.